Been away for a while hope you did not miss me too much. I have a request from a reader asking for Ma Lai Goh 馬來糕, a steamed sponge cake available in most HK style dim sum restaurants. My recipe is really simple no whisking the eggs till moussy. Just mix everything together and steam. 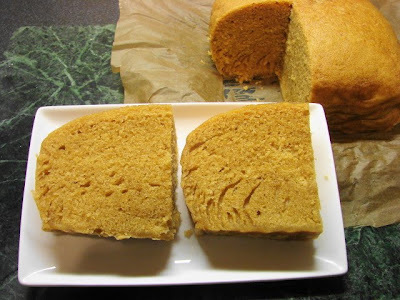 There are few unusual ingredients used one is custard powder to give the cake a rich yellow colour and flavour and few drops of dark soy sauce for the additional colour. I can assure you the soy sauce will not make the cake taste awful. Normally this cake only use vegetable oil, I like the flavour of butter so I use 50:50 butter and vegetable oil. Line a 7 - 8" round bamboo steamer/cake tin, or 7 - 8" square plastic container/colander with parchment paper. Some metal cake tin can go rusty if steamed so beware. I normally use a bamboo steamer or a plastic container/colander. Heat the milk, soy sauce, butter and oil together till butter melted. I put it in the microwave for 1 minute on high. Sieve the flour, custard powder, baking powder and bicarb together. Beat the egg and sugar together with a hand whisk for about 1 minute. Pour in the liquid (if still warm it's ok) and stir. Add in the dry ingredient. Mix till no lumps. Pour into the lined container. Steam for 30 minutes. The cake may drop a little but that is ok. Leave to cool till warm before cutting and serving. Here is a picture of the mixture before steaming. 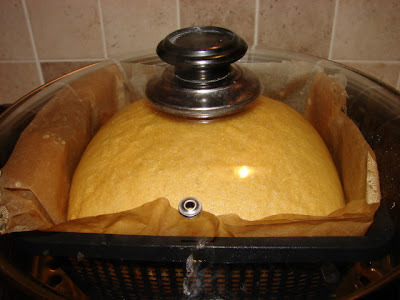 You will need a large steamer at least 30cm to steam this cake. If you have a wok with a domed lid you can use this for steaming as long as you have a steaming rack and the cake container will fit. During steaming condensation (water droplets) will build up on the inside of the lid and can drip on the cake making it wet and unappetising. 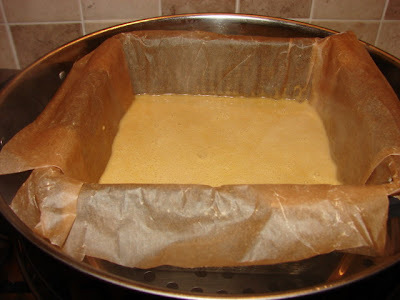 To avoid this, before you put the cake in for steaming, heat the lid till hot take it out wipe the inside of the lid dry. Then add 1 tsp of vinegar and 2 drops of washing up liquid, wipe the whole area of the inside lid with kitchen towel till completely dried then ready for steaming the cake. Here is the test I can show you the lid is almost 100% clear with no condensation during steaming. we DID miss you and are so happy you are back! wishing you a happy new year. Happy New Year. You had a smashing holiday? I will try this on Monday when I'm at my Mum's! I look forward to eating it! heh heh heh! Is the cake light, fluffy and full of bubbles? It's not super spongy. I think it is ok.
Sunflower, I come to your blog through Lily's Wai Sek Hong. I enjoy visiting your blog. Definitely will come back often. Thank you for the tips about preventing condensation. Will this work with metal lid as well? It will help but probably won't be as good with glass lid. Will work better if the metal is very smooth. Beuatiful recipes you have, Congratulations from Argentina. I´ll go through very now and then as time allows. Thanks and keep it up !! Bicarb is bicarbonate of soda/ baking soda. Just a quick question regarding the eggs and sugar, do you not need to beat them well till it reaches ribbon stage as with a traditional sponge? No just whip till frothy will do.